Wow, Amy is such a knowledgeable dog trainer. She not only teaches you how to train but she also helps you understand how your dog is communicating with you. She is so quick to pick up on little nuances between you and your dog, and help you with them. You can ask her anything and she is there to help. Seriously no dog is too much for her. Amiable offers classes specially designed for puppies who are UNDER 15 weeks of age. “House Puppy” and “Obedience Puppy” are 45 minutes each for three consecutive weeks; or 90 minutes WEEKLY if you enroll in “Puppy Combo.” Classes are held at the same time (and location) and can be taken simultaneously (highly recommended); or individually. See schedule. Class meets weekly (45 minutes) over three consecutive weeks at same time/location. COVERS manners • etiquette • social skills • accepting grooming and handling • car riding • preventing and stopping JUMPING AND STEALING. Learn the best ways to house break, crate train, and control nipping/chewing/excessive barking. To attend for 90 minutes each week, enroll in “Puppy Combo.” See schedule. Class meets weekly (45 minutes) over three consecutive weeks at same time/location. Teach your puppy to walk nicely on a leash and come at a distance. COVERS listening to sit, down, and come without treats, and introduction to boundary/curb training. To attend for 90 minutes each week, enroll in “Puppy Combo”. See schedule. 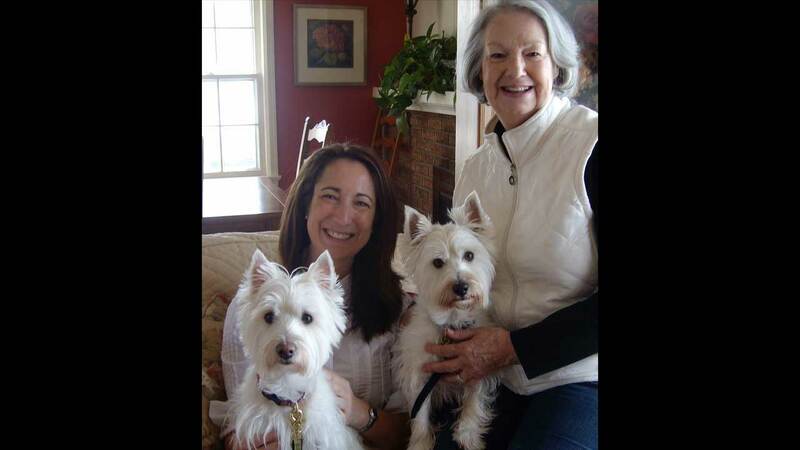 Amy taught me wonderful tools for training my dog, which I will continue with my other dogs. She’s wonderful! We were very happy with the training! The goals we set were more than met! Designed for dogs who are four months to twelve years in age – it’s never too late to start! Class meets weekly (45 minutes) for FOUR consecutive weeks at same time/location. 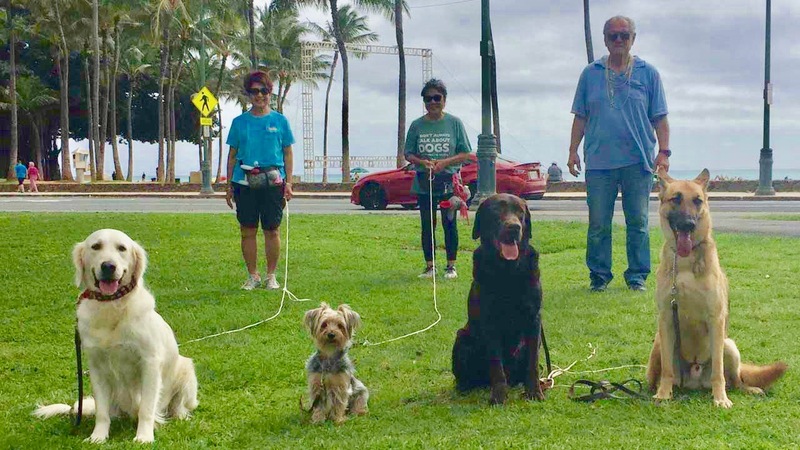 COVERS teaching your dog to walk perfectly on leash; listening to the first command around distractions; developing great social skills with people and animals; problem solving for any situation. See schedule. Have taken numerous training classes with Amy. We started out in Essential Basics and continued to Mastering Basics and Off Leash Control. The classes are very informative. Her follow up emails provide text and video on what was covered in class that week and what I should practice at home. I have recommended her to my family and friends. While walking my dog people often comment on Mocha’s good behavior. Builds on foundation of “Essential Basics”. Class meets weekly (45 minutes) for FOUR consecutive weeks at same time/location. COVERS • mastering sit, stay, come, and down at a distance • respecting doorways, curbs and boundaries • perfecting heel position • learning brand new commands. See schedule. Each one hour private lesson is scheduled for your convenience – days, evenings or weekends. Private training rates are the same regardless of how many dogs OR PEOPLE/HUMANS/INDIVIDUALS are involved. Lessons are customized for your needs. Available in Southeast WI (summer) or Honolulu (fall, winter, spring). Please call/text or email to arrange a time. One hour private lessons provide customized solutions • house soiling • social skills • chewing • barking • walking nicely on a leash • aggression toward people or other dogs • jumping up • separation anxiety • submissive urination • UNIQUE concerns. Each 30 minute private lesson covers assessment, practice and practical training strategies (based on lifestyle, abilities and your dog’s temperament). Lessons are customized, efficient, convenient and effective for problem solving (aggression/leash walking) or preparing for obedience trial competition. Available in Wisconsin (summer) or Honolulu (fall, winter, spring). Please call/text or email to arrange a time. 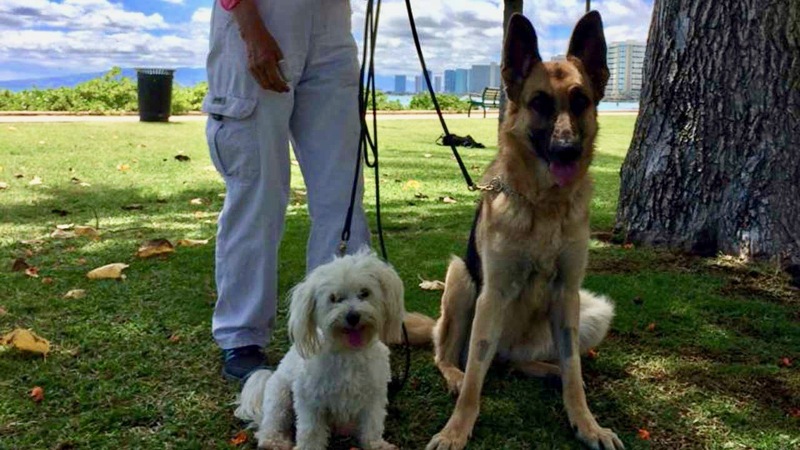 30 minute private lessons provide customized solutions • house soiling • social skills • chewing • barking • walking nicely on a leash • aggression towards people or other dogs • jumping up, off-leash control • UNIQUE concerns. Thanks to the power of video and screen sharing, personal online problem solving can be more effective (for certain problems) than private training or group classes. If you have a smart phone and can upload video, we’ll view it together via screen share, address problem areas specific to your situation, and work on solutions. We’ll talk three times, about a week apart, for about 20 minutes each time. The video screen share and conversation will be available for you to review any time and to share with other caretakers. To discuss your situation [or apply], phone/text Amy Ammen 414-289-7785. Got problems with your beloved buddy? I’ve got solutions! Let’s talk about how to stop aggressive tendencies, house soiling, over-barking, not listening, leash walking and so much more with practical, customized strategies suited for your dog and your lifestyle. Includes three live consulting sessions and a special bonus offer for in-person training in Wisconsin in summer 2019. Over excitability (at the door, in public, around other animals). Phobias (of noise, people, objects). Stealing (from counters, garbage, closets, laundry…). Destructiveness. Separation anxiety. Possessiveness/guarding (food, humans, locations). Problems grooming, riding in the car, and being handled. If your dog’s issue isn’t listed don’t worry, I can help! Requirements: 1) Computer, tablet or smartphone. 2) Apply. 3) Upload videos to Facebook or YouTube (or any location) as long as I can view the link. Application Info: your name, email, phone. DOG’s name, breed, age. Your frustration and goal. Additional Info: dog’s history, health, household dynamic (pets, people, schedule/physical/environmental challenges), or …? This “Field Trip” allows us to develop real-world skills and practice in public settings. We meet at a park and walk to a variety of environments. Dogs will learn to walk nicely and listen to the first command. Need to feel more confident handling your dog and teaching him to be mannerly in public settings? Then Walk This Way, Talk This Way workshops are the way to go! 60 minute workshop covers walking and social skills in a public setting. We’ll also address car riding behavior and anything that makes you apprehensive about having your dog accompany you in social situations. Prerequisite: enrolled in (or completed) Essential Basics or a Private Lesson. The class was more than what I expected! Using Amy’s approach, I now have more confidence and Spice was so responsive. Amy knows dogs and she certainly knows handlers. The feedback she gives is valuable. No brainer–take the workshop, get individual feedback, and then use it! Thank you, Amy!!! You have a dog, but you also have a life! Now that your dog is trained, the goal of this 60 minute workshop is to feel comfortable bringing him in public. Quickly and comfortably address problems in public so he can be your constant companion. Prerequisite: enrolled in (or completed) Mastering Basics. Step-by-step path to reliable off-leash control. We’ll meet at three different locations. You’ll learn keys to off-leash control PLUS strategic planning about: dog’s triggers • challenges and opportunities • best use of available space • enjoying the experience. Prerequisite: Mastering Basics Graduate. ENROLL NOW… Private Lessons are great if your schedule is variable (and not conducive to group classes), your dog is displaying aggressive tendencies requiring better control is attained before entering a group class, and/or you want customized techniques and strategies. However, if your dog is timid and needs confidence in social situations, please contact Amy to discuss her other training options. ENROLL NOW… Join Puppy Class to learn step-by step, fool-proof strategies in a cost-effective, efficient manner and gain confidence through interaction. However, if your dog is health compromised OR is too old (the cut off is 15 weeks on the day he begins classes), please contact Amy to discuss her other training options. ENROLL NOW… Join Essential Basics to learn the fastest way to develop a well-behaved confident companion in all environments and receive lots of personal attention for minimal cost. However, if your dog is dangerously aggressive or handler limitations require extensive customization, please contact Amy to discuss her other training options. 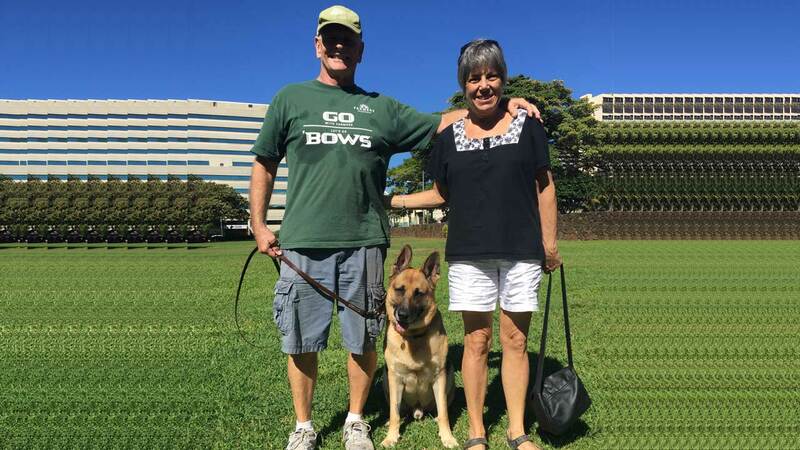 ENROLL NOW… Join Mastering Basics if you want to improve the bond between you and your dog, and raise your skills (and your dog’s understanding) of commands. However, if you have achieved all you want from the Essential Basics class, please contact Amy to discuss her other training options. ENROLL NOW… Join Off-leash Class if you want peace-of-mind that your dog will always listen so he can be safe and enjoy greater freedom. However, if you never foresee a time when a gate is left open, a caretaker is negligent, or equipment fails, please contact Amy to discuss her other training options. ENROLL NOW… If you have very specific goals and a short time frame to accomplish them, or need to resolve household behavior issues, multi-pet challenges or a problematic family dynamic. However, if your dog is perfectly well behaved in your home, please contact Amy to discuss her other training options. ENROLL NOW… If you want to work one-on-one with Amy to improve social skills or emotional control (or other problems), and will benefit most by working in a challenging environment with individual/custom instruction. However, if your dog exhibits NO behavior issues in public, please contact Amy to discuss her other training options. All group classes meet weekly at the same time and at the same location. Can I observe classes before enrolling? Yes, we have an open door policy so you are invited (and encouraged!) to watch anytime. Summer classes are held at Bluemound Animal Hospital in Brookfield on Monday evenings, and Sunday mornings through mid-day. No appointments necessary, but please leave your dog at home. If you have any questions before coming to observe, please call/text Amy at (414) 289-7785. Will I receive confirmation for class? Yes. If you enroll online or by mail I’ll contact you to let you know I received your registration, and I will ask for your dog’s name, breed, and birthdate. When you come to your first class there will be an enrollment form for you to fill out. Can my children come to classes? Yes. Family members are welcomed and encouraged to attend all of our classes. Children need to be mannerly and not disruptive. Regardless of how many people attend, one capable and attentive handler should be designated to train the dog in class throughout the entire program. Though we have no age restrictions, the responsibility of training is often too large a task for children under 13. On the other hand, some youngsters do make commendable trainers. We reserve the right to require that an adult or guardian step in to handle the dog if a child training a dog in class does not have the required handling capabilities. This depends on your definition of a “trained” dog. Some people have simple goals and others want the ultimate. Also, learning rates vary because both people and dogs have more aptitude in certain areas and less in others. Nonetheless, if you follow instructions you’ll start seeing rapid results even after the first lesson. How often do I need to practice outside of class? To keep up with class you’ll need to practice a minimum of 20-minutes each day. You’ll practice in the house, your yard, on walks, and in public. I show you how to incorporate practice into your daily routine. If you are motivated to practice longer than 20-minutes daily, that’s GREAT! Do you use food in your classes? Have you noticed you can’t reliably get your dog’s attention with food? Perhaps he is too excited or distracted or just not hungry enough to be motivated by a treat? That’s why I’ll show you how to teach and enforce basic listening skills using your hands, praise, and leash. But using food in training can be very beneficial so, when appropriate, I will also show you when and how to use it. Do you use positive training? Yes! We use an abundance of praise and play. In addition, you’ll never yell at, scold or use multiple commands. Therefore, Amiable dogs are eager to learn. Wagging tails and reliable response are hallmarks of Amiable dogs. What type of leash can I use in class? Bring your dog or puppy on 6-foot-long leash (please no retractable leashes). A leather or biothane leash works best (we carry leather and biothane leashes and collars at Amiable), but nylon or another material can be acceptable so long as it is 6-feet in length. Do I need to bring a training collar for my dog? A traditional flat buckle collar is all that is required. Please bring your dog or puppy on a well-fitted, secure collar (rather than a head halter or body harness) that your dog cannot break or back out of. Training collars such as a slip chain or a prong collar are not required but may be recommended depending on the dog and the situation. We’ll offer help in fitting and properly using a slip chain or prong collar if necessary. What if I need to miss class? You are welcome to make up any missed group classes during another session at no charge. If this isn’t possible, a private lesson can be arranged at an additional fee. If you need to miss a lesson please call/text Amy at (414) 289-7785 to make arrangements for a make-up. I’ve taken classes elsewhere. Where do I fit in with Amiable? Though many dog training schools offer classes with similar names, the agendas, objectives, and techniques of different classes vary widely. 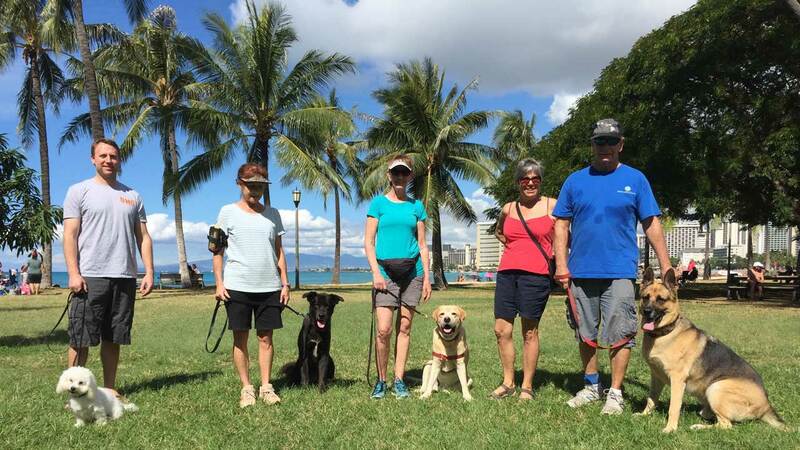 The prerequisite to our Mastering Basic Skills class is our Basic Essential Skills class, and the prerequisite to our Off Leash Control class is our Mastering Basic Skills class. Exceptions are gladly granted to former students of Amiable Dog Training who’ve trained their current dog to the appropriate level. At what age can I start to train my puppy or dog? Classes are offered for dogs eight weeks and up — but it’s never too late! It is very common to have middle age and older dogs enrolled in the Basic class and they progress as rapidly as puppies. I’m afraid my dog will go nuts around other dogs. Don’t worry…most dogs assimilate remarkably well, and we are here to help! However, for dogs who may be aggressive or unusually stimulated by the group class environment, an initial private lesson is recommended and can be arranged in your home or at our location. During the private lesson we will establish strategies to gain control around distractions so you build a foundation for the group class. Can my children (or others I invite) participate in this class? Whomever you’d like to include is welcome. Where appropriate, all those present and interested can participate fully in the lesson. Your dog learns with each interaction. When you react properly to your dog’s behavior he will learn instantly, provided you don’t take his improvement for granted. This is simple, fun, and immensely rewarding when we show you the ropes. Will we use food rewards to teach my dog to behave? We primarily use physical direction and praise. In certain contexts, food can be a very powerful tool in training. Many people use treats as a lure because it is the fastest way to entice the dog to perform a task. But be aware: there is a huge gap between following a lure and obeying a command. To bridge that gap, we demonstrate how to enforce commands by using your hands, praise and leash for guidance. This will also prove invaluable if your dog isn’t interested in the treat because his tummy is full or he is distracted. What type of leash is best? A 6′ leather leash or 6′ biothane leash is ideal for training because it is strong, versatile, and provides a non-slip grip (biothane is a synthetic material similar in texture and feel to leather, but it’s also washable. We have a selection of biothane leashes available for purchase at the training hall). What type of collar do you use? Whatever is best for your dog. Generally, a traditional buckle collar collar (the type your dog probably wears around the house) will work great. We prefer “belt buckle” style collars as opposed to “quick-release” types, as they tend to stay truer to size and don’t run the risk of breaking open unexpectedly like quick release collars sometimes do. A “training collar” (such as a slip chain or prong collar) is not necessary but may be recommended in some cases. After assessing your dog, your goals, and your physical capability, we can offer a recommendation and help you to properly fit and use the collar. I’ve gotten a lot of advice and my dog is untrainable. What makes you think you can help? Some dogs require more expertise than others, and unless you’ve had our extensive background, you could waste the entire lifespan of your dog trying to figure it out. You love your dog, and that is a great start, but love is not enough. I hope you’ll allow us to guide you to your goals in the most seamless possible way. Bring the Waiver & Application for Amiable Dog Training class enrollment the first day of class, or send it by mail or email. Bring your dog or puppy on a well-fitted, secure collar (rather than a head halter or body harness) that your dog cannot break or back out of. A traditional flat buckle collar, a slip collar, or a prong collar usually works well. For Basic Classes, a 15-foot-long longe line is needed. If you’ve never trained with Amiable Dog Training in the Basic Classes, wait until your class begins to get this piece of equipment. You can purchase this from us or make it yourself. Bring a rug or blanket for your dog to lie on, if you like. This will help your dog to be more relaxed and content when we are stationary for brief periods. For Puppy Classes, feel free to also bring along a Nylabone or other toy to help occupy your puppy when between working sessions. If you are concerned your dog might have an accident at training, keep your dog on a short leash indoors and bring “accident baggies” to clean-up any messes. To ensure everyone’s safety and comfort, please keep your dog on a short leash unless you are letting him relieve himself outdoors or are instructed to do otherwise. Be respectful of other peoples’ and dogs’ personal space, and do not allow your dog to rush up and greet another without first asking permission. Many different commands and exercises are recommended and explained in class. Practice these a minimum of 20-minutes each day so you are ready to advance to the next step, which will be introduced in your next lesson. You can break your practice into several daily sessions if you like. Incorporate homework into your daily interactions in the house and yard, on walks, and in public. If you are motivated to practice longer than 20-minutes daily, that’s GREAT! Your dog or puppy must be free of internal and external parasites and current on vaccinations (rabies for dogs four months and older, and combination/DHLPP and bordetella for all enrollees). Please bring a copy of your dog’s or puppy’s vaccination records with you to your first class. Bring family members, children, neighbors, or friends to class with you. Where appropriate in Puppy Classes and Private Lessons, all those present and interested can participate fully. When training in the Basic Classes, however, we do ask that you establish one primary dog handler who will work with the dog during classes. Other family members can observe during class and practice the techniques demonstrated in class at home. WORKSHOP enrollment may require an ‘audit’ fee for attendees not working a dog. Group classes are held at Bluemound Animal Hospital in Brookfield, WI and several other locations in Milwaukee and Honolulu. Need address or directions? Please see the “Locations” page. Bring a chair for you and your guests.